This blanket is made in separate pieces and then crocheted together. It is available as a one piece in ETSY. 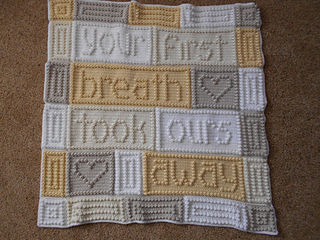 The entire blanket requires only three crochet stitches - chain stitch, single crochet and the popcorn stitch. The pattern includes the instructions, a list of materials and the yarn amounts needed for a finished blanket approximately 37” x 38”. The pattern can be customized to your own color choices. 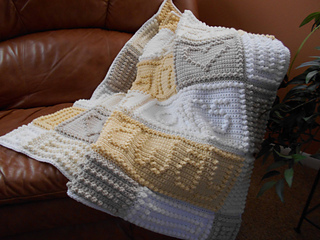 The blanket in the photo was made using Hobby Lobby’s I LOVE THIS YARN in white, ivory, linen and cream.